We may always confront famine as a cultural and political artifact but we must soon conquer the fungus which caused the Famine before we loose the Potato. Try spending a day without the potato to learn what this might be like! Note- links are not being updated to outside pages. The information is kept here as it may be of assistance. Late blight, the devastating tuber disease that triggered the Irish potato famine of the mid-1800s, has a new partner in crime. Scientists with the Agricultural Research Service (ARS) in Orono, Maine, discovered that Phytophthora infestans—the microorganism behind the spud-spoiling disease—is seeking refuge in potato fields, holed up in an alternate host plant: hairy nightshade. Best known for causing widespread hunger, illness and death in 1840s Ireland, P. infestans continues to pose a formidable threat to global potato and tomato production. 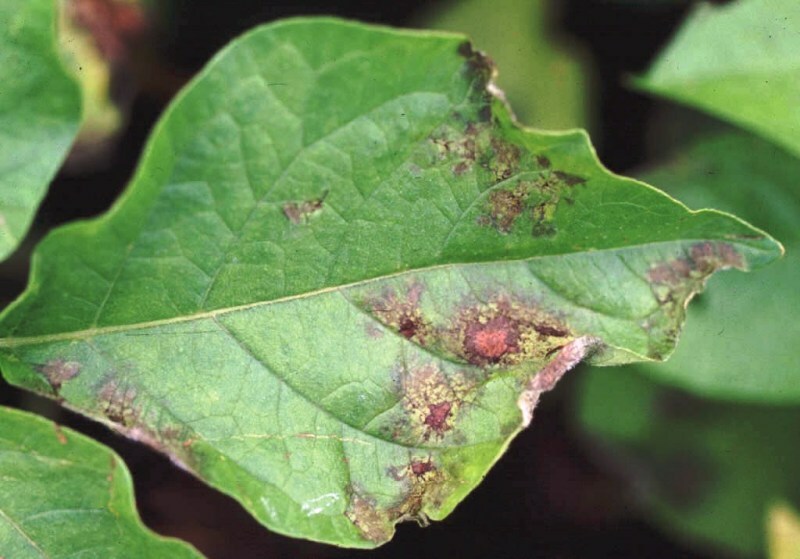 According to the International Potato Center in Lima, Peru, the disease costs the world's growers more than $3 billion each year in fungicides and other control measures. Modesto Olanya, a plant pathologist at the ARS New England Plant, Soil and Water Research Laboratory in Orono, learned of the possibility of an alternate host in 2004 from colleagues at the University of Maine Cooperative Extension in Presque Isle. As extension agents in the northern part of the state discovered, hairy nightshade plants were showing up speckled with suspicious dark and oily spots. Olanya analyzed the microorganisms on the plants and verified, for the first time, that hairy nightshade is an alternate host of P. infestans in Maine. To make matters worse, hairy nightshade is hardly a wallflower, in terms of its presence in commercial potato fields in Maine. In a limited survey, Olanya and University of Maine collaborators found that 55 percent of fields assessed in the state contained the plant. According to Olanya, the finding that hairy nightshade is an active host of P. infestans is problematic in two ways. First, the plant is a secondary source of the destructive disease. And, it's a weed. As a result of this ARS research, growers are now learning the importance of controlling hairy nightshade as part of their overall late blight management program. ScienceDaily (Mar. 19, 2004) — In June 2001, North Carolina State University plant pathologist Jean Beagle Ristaino shocked the scientific world when she published a paper in the journal Nature that called into question the then-prevailing theories about the strain of pathogen – and its place of origin – that caused the Irish potato famine in the 1840s. About 90 percent of the specimens were confirmed to be infected with P. infestans, the paper reports. About 86 percent of the specimens – including those involved in major epidemics in Ireland and other locations around the globe – were infected with the Ia haplotype of P. infestans. The Ib haplotype – the one previously presumed to be the culprit behind the Irish potato famine and other epidemics before Ristaino's groundbreaking 2001 study – was present only in more modern samples from Central and South America. 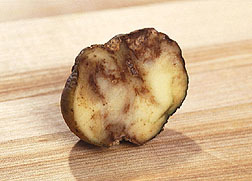 Moreover, the researchers found two strains – Ia and IIb – in potato specimens studied from 1950s Nicaragua. This finding further debunks the single-strain theory that prevailed before Ristaino's 2001 Nature paper. Ristaino's lab is currently investigating the center of origin of P. infestans. She hypothesizes that the pathogen originated in South America and perhaps made its way to Europe and the United States via exports of potato seed on steamships. The data to support this hypothesis will be published by one of Ristaino's graduate students, Luis Gomez, in the next year. The late-blight pathogen led to the Irish potato famine, which killed or displaced millions of Irish people, and other epidemics across the world. Late blight continues to wreak havoc as a major potato and tomato killer, which makes Ristaino's research all the more important. "If we can understand the strains of P. infestans that are out there now and see how the pathogen has evolved over time – including how it mutates in response to fungicides or host resistance – we'll better be able to manage the disease," Ristaino said. Plant Virus Taxonomy database - The descriptions are derived from the VIDE (Virus Identification Data Exchange) database, using the DELTA system, including data on host range; transmission and control; geographical distribution; physical, chemical and genomic properties; taxonomy and relationships; and selected literature references. Included are the database accession numbers (up to Gb and Em) of the genomic sequences of viruses and of satellite RNAs, with links to the NCBI taxonomy database to facilitate searches for these and for more current accessions. There are generic-level summaries of data for viruses that are definitive or tentative members of genera or 'groups'. There are also tables (with appropriate links) listing over 1500 host plant species, and their reported (experimental) susceptibilities to these viruses. US Dept of Agriculture's "Biotechnology Permits; the Importance of the Potato"
"Purdue researchers genetically engineer blight resistant potato." Science Update page -- A nice narrative of the history of the Famine, with explanations of some of the potato diseases which caused it. News Reports on P. infestans. Potato Blight is still a problem today! All about the potato and potato crop computer modeling. Stick finger-length pieces of copper and zinc wire one at a time into a raw potato. If you hold an earphone on the wires, you will hear a distinct crackling. The noise is caused by an electric current. The potato and wires produce an electric current in the same way as a torch battery, but only a very weak one. The sap of the potato reacts with the metals in a chemical process and also produces electrical energy. We speak of a galvanic cell because the Italian doctor Galvani first observed this process in a similar experiment in 1789.